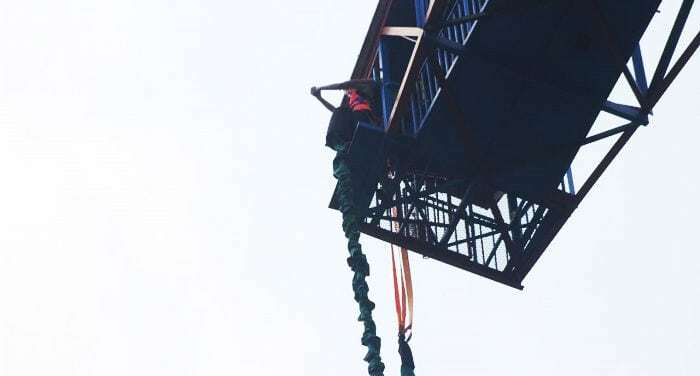 I had always wanted to go bungee jumping, but I was skeptical about doing it in China. I spoke with my friend about it, and we decided that if it looked sketchy, we would just watch the others jump, no pressure. It would still be a good getaway from Shanghai anyhow, so it seemed win-win. On the day of the trip we showed up to the meeting spot at the People’s Square metro station around 8 am, and stood awkwardly with 20 other strangers (around half Chinese people and half foreigners) waiting for late comers. After everyone had arrived we got on the bus and started our three hour drive to Ningbo. The drive wasn’t particularly inspiring; we passed through lots of small towns and had conversations about life while gazing out at the smog filled sky. We finally arrived to Ningbo HarborLand Park around 11:30 am, and pulled into a parking lot across the street from a shabby looking amusement park. Everyone filed off the bus and followed to leader to the entrance, excitedly chatting with whomever they had come with. The amusement park itself was something quite odd; it was almost like those amusement parks you see in Hollywood films from the 1980s, that hadn’t had the paint retouched. There were bumper boats in the man-made pond, a big swing ride far to our right, and a faded yellow roller coaster complete with loops and spirals. When we walked through the turnstile we saw it: a nine-story blue structure for the bungee jump. We saw three people standing on the yellow platform. 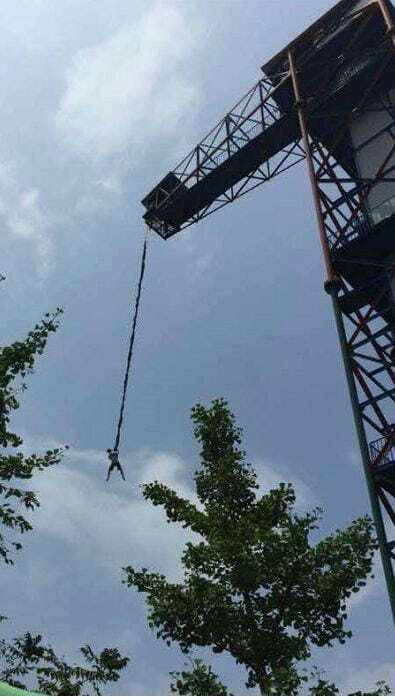 There was a brave man donned in a body harness, standing on the edge clasping his hands out in front of him, and two employees holding onto his harness. The employees counted down, “San, er, yi!” and they gave him a small push off the platform. Down he went in screaming somersaults until the bungee cord stretched and pulled him back up, allowing him to bounce for a few minutes. My friend and I looked at each other. “It’s fine, it doesn’t seem that high,” I said as I shrugged. She gave me a look of dismay and we followed the others to the bottom of the structure. We arrived at a small office at the bottom of the bungee tower and one by one signed waivers. Said waivers were in Chinese, but we had some of the others translate to us that the document basically said we couldn’t sue them if anything happened, pretty standard. They took our blood pressure, and then separated the thirty of us into three groups, according to weight. My friend and I were in the second group, so we went outside to watch the first group take the leap. We waited for about twenty minutes watching the others jump, and assured each other that it wasn’t that high or that long. Before we knew it our group leader came and got the second group, and we hesitantly headed through the office to the elevator to head up. The ten of us loaded into the elevator, and went to the eighth floor. When we exited the elevator we climbed up two flights of stairs, and I realized the tower was a bit higher than I thought. Once we got up to the platform we lined up based on numbers they had given us, and watched the first two step into the harnesses to prepare for their turns. No building or structure ever seems very high until you’re at the top of it. From the platform we could see the whole amusement park, and the neighborhood it was situated in. We watched other patrons ride the big swings and roller coaster, and watched the employees get the others ready to jump. They did a series of checks to see that the harness was put on correctly, and double checked each other’s checks, which was reassuring. One by one we watched the other group members sail off the edge, some screaming, some silent, but all excited after they had been pulled back up. Suddenly it was my turn. I was handed a harness by an employee, and I stepped in. The employee motioned for me to walk out further on the platform and meet him, and I tried to mentally prepare myself. The employees did their checks on my harness, hooked me up to the bungee, and double checked the safety. They took me over to the jumping platform, which looked like a doorway on the edge of the otherwise enclosed gangway. As I held onto the sides I stepped onto the edge, and looked down. As soon as they took my hands and had me clasp them out in front of me, everything sank in. Until that moment I hadn’t really been thinking about the jump. In that moment I realized they were going to push me off, and I tried to stay calm. They counted down, I took a deep breath, and they pushed me off. Down I went, screaming my head off all the way, eyes pinched shut out of reflex. I felt the bungee catch and I shot back up in the air, and opened my eyes. I started laughing uncontrollably as I bounced through the air. I eventually came to a stop, and they began to pull me up as I was shaking. I grabbed their hands and crawled onto the platform, breathily saying “That. Was. Awesome.” As they took my harness off I nodded at my friend, and excitedly shouted “Can I go again?! Can I go again?” I was high on adrenaline and proud of myself for doing something so frightening. My friend made the jump, but needed a little more convincing. We had similar experiences – we agreed that it was intense and scary, – but we both enjoyed it and were glad we did it. Would I do it again? Nope. Once was most definitely enough. We paid for the pictures that were taken of us and laughed hysterically at our expressions while plunging towards the Earth. After everyone made their jump we got back on the bus and headed to the ‘beach’, which turned out to be quite dirty, but salt water nonetheless. We couldn’t swim, but we had a barbeque with delicious food, conversation, and plenty of liquor while we watched the sun set. After a few hours we headed back to Shanghai, everyone napping in the bus. 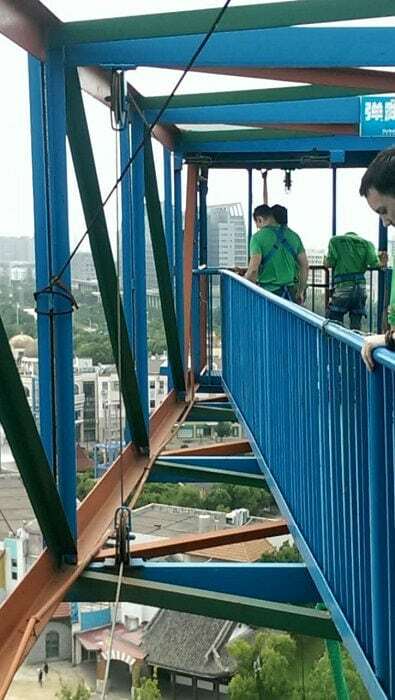 The fact that we went bungee jumping in China made us skeptical, because there are always news headlines about buildings collapsing or faulty infrastructure. Bungee jumping isn’t something that you want to take any risks with, so initially we were a bit doubtful of the safety of the activity, especially once seeing how some rides in the park were. It looked safe, however, and it helped to see people go before us. I think doing an activity like this in a foreign country is always doubt-inducing, and if we did it in the US or Canada we would have had no reservations. Overall it was a great experience, and we were really glad we did it. 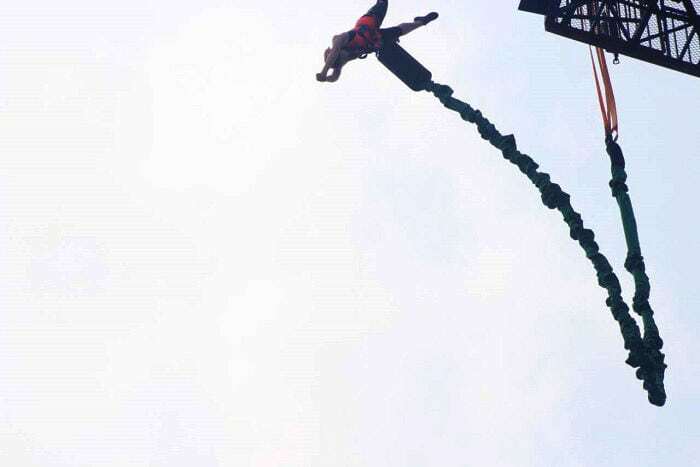 I would definitely recommend bungee jumping to everyone to try just once, even in China. This is one thing I love about this country – it may be crazy at times, but there is always something fun to do and some way to challenge you. Rachel is currently living in Shanghai, China, working in sustainability research and consulting. She loves traveling, rock climbing, salsa dancing, and trying new food.